Post race fun at Whitsunday Sailing Club - Vampp Photography - ABRW. Holy Cow - a perennial competitor. Post race entertainment at Airlie Beach Race Week. Photo Vamp Photography. Colourful Fun at Airlie Beach Race Week. Image Copyright: Teri Dodds. Entries have closed and Whitsunday Sailing Club organisers are pleased with the large jump in numbers to 119 received for the 30th anniversary Airlie Beach Race Week, which for a range of reasons, continues to attract a profusion of boats every year. First off the bat, Race Director Denis Thompson sets the ‘thinking person’s’ courses each year - and the racing is always competitive. Add to that the pristine waters, breathtaking scenery, sea life at play and a family-friendly social program different to any other in Australia, and you have a recipe for success. “We try to re-invent Airlie Beach Race Week Festival of Sailing a little each year to keep it fresh, to keep competitors coming back and to draw new ones,” says Ross Chisholm, WSC Event Chairman. “Our race management team is world class, which is necessary to run an event of this magnitude and to give our entrants from around Australian and overseas the competition they deserve,” he ended. To that end, Thompson has organised variations of course for each division, taking into account the fleet, tide and race distances. And courses take in some of the most beautiful islands and scenery in the world. Apart from the big names coming to contest the two IRC divisions, for the first time, the Fareast 28R class will hold its Australian Championship at Airlie Beach Race Week. It will be sailed inside the 17-strong Performance Racing division - so two main trophies are on the line. Former Farr 30 sailors, Drew Garnet, Michael Foster and Steven Knight are new converts to the 28R and are looking forward to competing in their new class: "We saw the boat a bit over a year ago - it looked razor sharp and went like a bullet - it ticked a lot of boxes,” Valkyrie’s NSW skipper, Drew Garnett says. Brett Whitbread will be amongst Garnett’s challengers. An extremely competitive sailor, who loves the adrenaline rush of One Design sailing, he has been instrumental in attracting people into the VX One in Brisbane. At Airlie Beach, Whitbread will be crewed by VX One mates on the new ‘Pipeline Drillers’. Going by past performances, this team should be the ones to beat. Long-time Airlie Beach Festival of Sailing competitor, Roger Jepson, is driving from Melbourne for a seventh time: "We don't need a route planner anymore,” he says, laughing. “It’ll be interesting to race against the others. The boats are identical, there are no handicaps, so every mark rounding tells you if you did the right thing – or not,” ended Jepson, who finished sixth in Performance Division 2 last year, sailing Whereswall II at her first major regatta. Those to watch in Performance Racing, outside of the Fareasts, include Tow Truck (NSW). The Patersons, Anthony and Graham, have runs on the board in a variety of boats, this time it’s a Melges 32. And there is last year’s Trailable Yachts division winner, Goggles, with his Thompson 7, Mister Magoo (Qld). Seven Trailables will clash for the title this year, none of which featured in the top three in 2017 – so it’s a clean slate. Closest from last year is fifth placed All Guns Blazin, Queenslander Tony Briggs’ Blazer 23. A renaissance in the Multihull Racing division, bolstered by two Kiwi trimarans out to do some damage to their Trans-Tasman rivals, has resulted in nearly double the numbers of last year. Ullman Sails, the Grainger Appex owned by Paul Mitchell, will have a hard time defending his 2017 title. 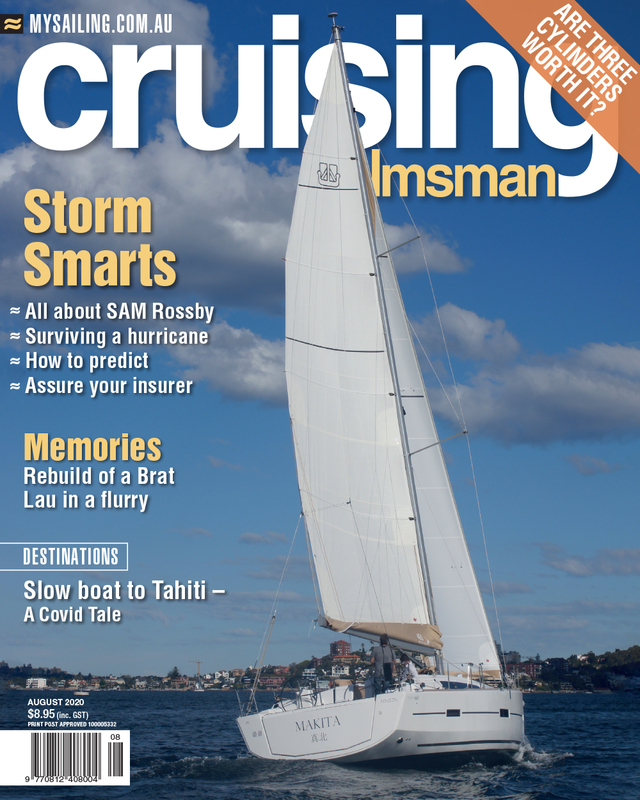 Sports Boats and Cruising divisions are also on the menu, but don’t let the ‘cruising’ title in the latter fool you. These boats are just as competitive as the next and the action on their start lines alone is exciting to watch. Airlie Beach Festival Race Week Festival of Sailing invites one and all to come and partake of all it offers. Family, friends and locals alike are welcome to view racing and attend social functions.